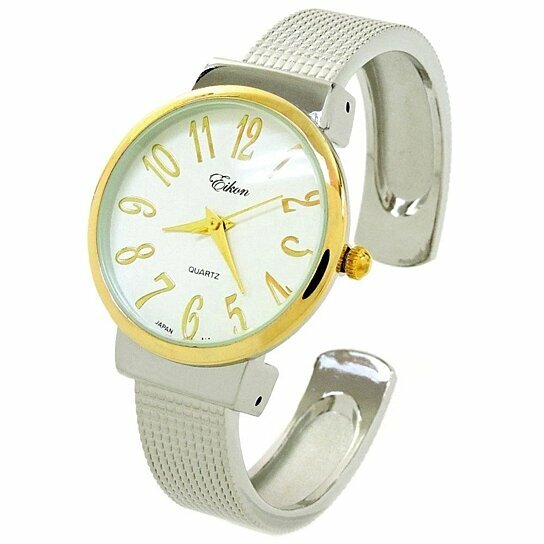 Elegant & Slim design Bangle Cuff Watch by Eikon. Cuff will open to fit all wrists from 6.25 to 7.25 Inches. The surrounding case is made of highly polished gold tone and has a white dial with gold hands and large numerals. The band is about 11 mm wide and has a mesh style design. Very classic and sleek watch and very easy to wear on and off.